Mang Inasal, the leading Pinoy fast-food restaurant that serves the 2-in-1 sa Laki, Nuot sa Ihaw Sarap Chicken Inasal, successfully celebrated the third National Halo-Halo Sarap Day (NHHSD) with its customers who got to enjoy the creamiest Pinoy halo-halo at P20 off in all Mang Inasal stores nationwide. Delighting customers with their surprise store visits were the “General’s Daughter” star Angel Locsin who went to the Mang Inasal Circuit Makati store and comedian Empoy Marquez who went to SM Fairview and SM Novaliches stores during the NHHSD. Starring in the latest Mang Inasal Pinoy Halo-Halo TV commercial aired on the same day as the NHHSD, Angel told customers at the Circuit store that she is really a member of “Samahang Simot,” or those diners who really finish their halo-halo up to the last drop. “Narito po kami ngayon ng Mang Inasal para magpasalamat sa inyong walang sawang pagsuporta sa Pinoy Halo-Halo. Alam naman po ninyo na talagang paborito ko ang Pinoy Halo-Halo dahilito ang da best sa creaminess. Espesyal ang gatas nito dahil ito ay ginawa lang para sa Mang Inasal(We are here today to thank you for your endless support for Pinoy Halo-Halo. You know that it is really my favorite because it is the creamiest. It is made from special milk made exclusively for Mang Inasal),” she said. One of the customers who came to celebrate was a balikbayan from Malaysia, Susan Casteral, who came with her son. She always eats at Mang Inasal everytime she goes back to the Philippines. She said that she loves eating the Mang Inasal Pinoy Halo-Halo because it has the right amount of sweetness and the creaminess that stands out. Josephine Quiatchon, who came with her friend, is a senior citizen who loves Mang Inasal Pinoy Halo-Halo. She finds it really delicious because it has the creamiest milk and generous serving of ingredients. “Kahit senior na at sipunin na, tuwing summer kumakain talaga ako lagi ng halo-halo(Even if I’m already a senior citizen and would always have colds, I still make it a point to eat halo-halo during summer),” she jovially shared. Katrina Nagidao, who came with her daughter, even won a prize in one of the NHHSD raffle draws at the Mang Inasal-SM Novaliches store. She said that she and her daughter always eat at Mang Inasal since her daughter loves its Chicken Inasal, while she craves for its creamiest Pinoy Halo-Halo. 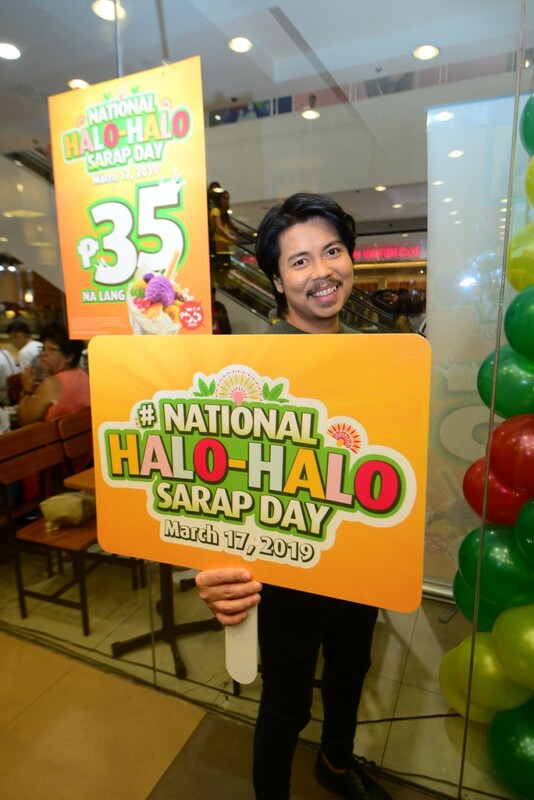 Mang Inasal Brand Manager Schubert Quilinquin said that the National Halo-Halo Sarap Day was celebrated in over 500 stores nationwide as Mang Inasal’s way of showing its appreciation to its customers who contributed to making its Pinoy Halo-Halo a well-loved dessert or merienda (snack). “We thank everyone who joined us in celebrating the National Halo-Halo Sarap Day this year. We hope to celebrate with all of you again next year, as we prepare more surprises for you at our stores,” he said.